Registration for those wishing to attend the European Club Meeting the following morning. Buffet dinner and overnight accommodation. Conference Registration, European Working Club Meeting and Conference opening Sessions. Registration for the European Club Meetings and BDS Conference. The Thames Barrier became operational in 1983 and was first used in 1984. It was constructed to stop flooding in the lower part of the tidal Thames . 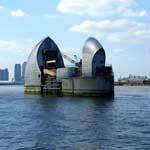 The width of the Thames Barrier is 520m bank to bank with four main openings each having a clear spans of 61m each. There are 10 gates associated with the structure retained between reinforced concrete piers. Each of the four main gates are 20m high and weigh 3700 tonnes. This tour will also provide an opportunity to view the stretch of the river Thames between the Barrier and Westminster by boat. The Leigh Barrier was constructed in 1981 to address a historical flooding problem on the rivers Medway and Eden that threatened towns and villages on the course. The dam is 1.3km long with a maximum height of 5.7m. The reinforced concrete control structure consists of three 7m radius screw driven radial gates and St Anthony Fall’s type spillway. The volume of water stored at full capacity is 5,580,000m3. Bewl Reservoir was completed by Southern Water in 1975. The surface area of the impounded water covers over 770 acres with the dam itself being half a mile long. The dam is constructed of a central rolled clay core supported by sandstone shoulders. The upstream slope is protected by a five-inch thick concrete slabs overlaying a twelve inch thick gravel layer. There are two towers with the reservoir basin. One for abstraction purposes with the second being a vertical overflow bellmouth. King George V Reservoir is a non-impounding reservoir, which was completed in 1913. The reservoir is 6.5km long and is divided in to two compartments by an earth embankment which contains large diameter uncontrolled culverts. The embankment has a central puddle clay core and has a maximum height of 10m. The upstream slope protection consists of brickwork at high level with concrete slabbing in its middle third. It is planned that the reservoir is to be drained for improvement works to the outlet facilities during 2004. William Girling Reservoir is a non-impounding reservoir which was completed in 1951. The reservoir failed during its construction and was subsequently reconstructed with a mid-level berm. The maximum height of the earth embankment is 14.3m. The upstream slope protection consists of concrete slabbing to full depth and the reservoir also has a central puddle clay core. The reservoir stores 16511Ml of Raw Water. Both King George V and William Girling reservoirs are owned and operated by Thames Water and form part of the Lea Valley chain of reservoirs supplying water for treatment in the North London area. It is hoped that delegates will be able to see remedial works consisting of the construction of a downstream berm on this non-impounding reservoir situated to the north of Lewes. Click here for details of session location, chairing, reporting etc.